We have beg un to notice that some Phoenix area Oleander’s have contracted a bacterial disease called oleander leaf scorch. This disease is the reason the leaves on these long-lived shrubs are drooping, turning brown and dying. As the disease progresses, more branches of the plant are affected and the plant dies. Symptoms can be expressed year-round, although they may be more noticeable in late spring and summer; they develop more quickly in warm weather. It can take three to five years from the time symptoms are spotted for an oleander to die. Cutting off affected branches may slow progress of the disease, but won’t stop it. Fortunately, the bacteria that causes oleander leaf scorch does not survive in the soil where the plant was growing. Thus other shrubs and trees can be planted in the same spot. In some cases, the oleanders’ demise can be an opportunity to bring new and unusual plants to the landscape that will serve the same purpose and are equally drought tolerant! Be sure to use caution when removing dead oleanders because of their poisonous state, or call Landscaping by Andre to assist with the removal. 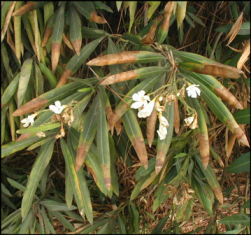 For more information on oleander leaf scorch or to have us evaluate your oleanders, call us at 480.483.8088.